Visit the best known symbol of Harbor Beach, Michigan…the Harbor Beach Lighthouse…up close and personal. Experienced and knowledgeable tour guides will share interesting information about all aspects of the lighthouse, breakwall, and harbor. Tours are conducted on Saturdays from the middle of June through the end of September. The boat, a 31 foot Cherokee, from J-Lyn Fishing Charters leaves the Harbor Beach Marina starting at 9:20am and then about every 20 minutes until 40 minutes before closing time. DO NOT, repeat, DO NOT forget your camera. The 360 degree view from the top of the lighthouse is one you will not forget. The best photo opp of the day is on the gallery level of the lighthouse, taken through the porthole. Tour guides are happy to help you with this once in a lifetime memory. Tickets are $20 each and also include a $2 discount to the to the Harbor Beach Grice House Museum, which houses the original Fresnel Lens from the lighthouse. The Grice House Museum is located adjacent to the marina on Ritchie Drive and provides visitors with a comprehensive view of the history of Harbor Beach and its residents. Two admissions for the price of one… and both are unique opportunities that Harbor Beach is proud to share with you! TOUR DATES FOR 2018 WILL BE ANNOUNCED IN THE SPRING. Sign up for our newsletters to find out when the dates are available. Why not experience the ultimate lighthouse experience before the kids go back to school…or pick a Saturday in September to enjoy the colorful Lake Huron shoreline from the top of the lighthouse. It’s one a kind in Harbor Beach, Michigan. Make your reservations today and we look forward to seeing you soon. USLHS members receive a 10% discount at the gift shop the day you visit our Lighthouse by showing your membership ID. To purchase advanced tickets and tour gift certificates, click here. Charlene from CO: Awesome to see!! Mike from Ypsilanti: Great job! Wonderful tour! Sandy from Spruce: Wonderful tour! Very informative! Learned more here than in the last eight lighthouses I’ve been to. Valerie: Amazing views. Wonderful informative volunteers! Sally from IA: Really enjoyed all the great info and friendly guides! 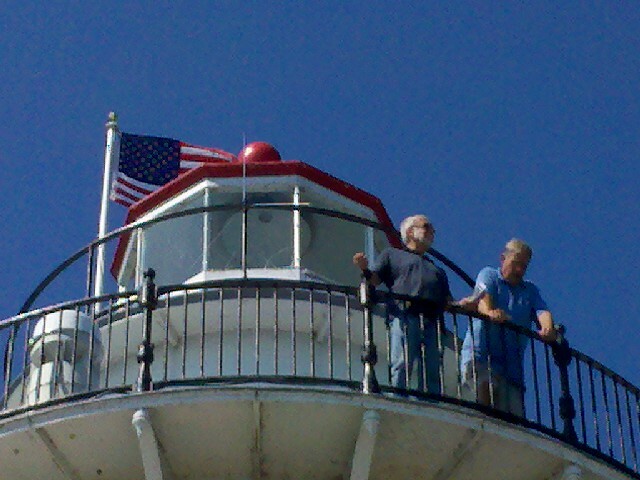 Ralph from IA: Best lighthouse tour in MI!! Margaret from NJ: Very worthwhile experience! Thanks for keeping this “alive”! Terry and Connie from East Tawas: When Connie and I had the opportunity to visit the Harbor Beach lighthouse on a postcard perfect Saturday morning in August 2013, we were both in for a surprise from the wonderful group giving the tour. We had the pleasure of riding the first boat out with the volunteer lighthouse keepers. The start of learning the history was given in such a professional way, it was an enjoyment to experience lighthouse life as it was told by the group. I had the opportunity to spend my career in the United States Coast Guard, and although never stationed at a lighthouse I always thought it would be a great experience!